Cockroaches are omnivorous scavengers, which means that they eat virtually anything they can get their mandibles on. They are also highly resilient insects, being able to live for months with a minimal food supply and go weeks without water. When attempting to rid your home of cockroaches, it is therefore crucial to keep both their food and water supplies to the absolute minimum by following the steps outlined below. Refrigerate – Any food in the house should ideally be kept in the refrigerator. The refrigerator is a self-sealing environment, and a cold one. As cockroaches prefer warm to cold and can fit through cracks as small as 1/16 of an inch wide, the freezing and thoroughly sealed space inside the fridge will effectively keep them from surviving on your groceries. Seal – Any food that you do not wish to keep in the refrigerator should be kept in tightly sealing plastic containers. This goes for bread, fruit, and any other food product that you might otherwise leave sitting on the counter. Though you may not see roaches going for these food sources during the day, roaches (being nocturnal creatures) will happily creep out at night to munch on them as a midnight snack. Vacuum – Keeping your floors free from food particles and the other insects that such particles attract subtracts both crumbs and bugs from the cockroaches’ potential menu. Wash – Washing dirty dishes and wiping down surfaces with anti-grease solutions after meals is essential in keeping cockroaches from thriving in your home. The fact that a cockroach can survive for up to a week on a single greasy fingerprint is a good incentive for keeping your dishes, tables, chairs and counters clean. 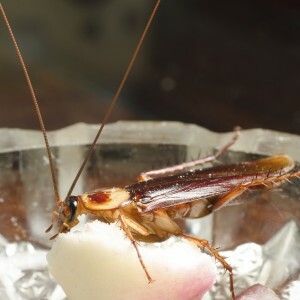 Dry – Water (and juices that contain water) are better than food for a cockroach, as cockroaches can survive with water but no food for months on end, while given food but no water they can only survive for about a week. Drying up spills, toweling off the sink and/or tub after you shower or bathe, and plugging up the drains will keep roaches from finding the water that they need to survive. If you are successful in keeping both food and water entirely inaccessible to your roaches, they can be dead within a week. However, because cockroaches are so resilient and require so little sustenance to survive it can be highly difficult to be vigilant enough to exterminate them yourself. If your roaches have persisted despite your best efforts to eliminate their food and water supplies in your Philadelphia tri-state area home, you can save $50 on roach extermination treatment by calling Green Pest Solutions today.